This is the one time of year when folks in the metropolitan area start talking about college basketball. March Madness talk starts to become part of sports radio discussion, and Final Four ads start showing up as well. And then the infamous brackets start getting passed around at the office and suddenly everyone is an expert. I was sure that if it weren't for gambling, college sports would go the way of the dinosaurs, That is, until I moved down South. There, college basketball is a year round passion. Every day is another big game, and practically everyone is known by the school they support. I was told that sooner or later I would get caught up in it, but three years went by and other than knowing who Coach K was (but not how to spell the full last name), I left North Carolina without caring about the ACC any more than before I even heard of it. So here we are in March, and college basketball is again crowding its way into the discussion, and I am here to say, March, March go away please bring on Opening Day. The WBC plays on, but without the Dominicans as Jose Reyes and Pedro Martinez couldn't beat the Netherlands to advance in the tournament. So Jose and Tatis are back in Mets camp, and Pedro Martinez will have to find some other way to show he still has the ability to pitch effectively and convince GMS that he is healthy enough to do so for a full season. I'd rather have Pedro Martinez's lion heart on the squad than Freddie G, Livan, or Redding, but it's not up to me so I'll save my breath. 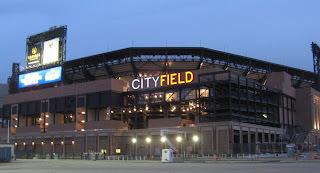 I scored some tickets to see the Mets at CITY FIELD, though not Opening Day, and let me tell you I am salivating at getting myself into that ballpark. I can't wait to search for my name on the Fanwalk, pose for a picture next to the old Mets Magic Home Run Apple, and have myself some stadium fare. In fact, I told my buddy Tubby to bring his wallet because we're going to stuff our faces with the new grub so much that we're going to be the first people to clog up those new toilets! Most of all of course I'm excited to see the old Mets at the new Shea. I'm going to pretend it's Opening Day because they are handing out magnetic schedules at the gate, an Opening Day tradition as far back as I can remember. This year they'll give them out on Sunday April 19th and since I was shut out of Opening Night anyway I have the right to pretend, don't I? Sunday April 12, 1 p.m.
Sunday May 24, 1:30 p.m. Put away those goggles. Call him Tardy, Dirty, or just washed-up, but Duaner Sanchez has been released by the New York Mets.